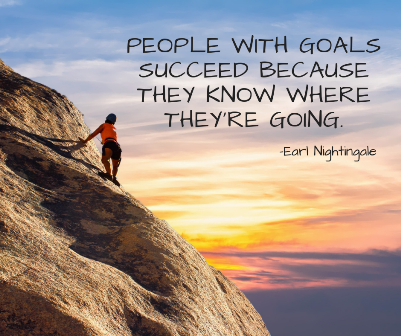 Goal Setting & Achievement: Getting There From Here! When you run samples in your lab, you don't run them to kill time; you have an end result you are trying to achieve. Everything done in the laboratory should be done with purpose. If there isn’t a purpose, there isn’t meaning and the desired result isn't achieved. While this is a very simple thought, we can easily apply it to everything we do in our lives, professionally or personally. A great way to start acting with purpose is to set goals. Proceed with caution, though; the journey to achieve your goals is not an easy one. It’s a fully-involved process of deep thought, planning, self-discipline and determination. However, the pay-off will be greatly worth your efforts. Is it time-bound (Is there a set date)? Is it yours (Are you really passionate about it)? If you cannot answer “Yes” to all these questions, you may want to rethink your goal. Also, when stating your goal, avoid phrases like “I will try” or “I think.” In order to reach your goal, you must be 100% committed, and phrases like these will only give you an excuse to chicken out. My Goal: I WILL run the BCS Marathon this year. Benefits – What will you gain by accomplishing your goal? Consequences – What will you lose if you fail to achieve your goal? Rewards – What special treat (other than achieving your goal) will you reward yourself for following through? Penalty – What punishment or negative reinforcement will you endure as a result of not meeting your goal? You control rewards and penalties. Use these as extra forces to motivate you on your journey. The more appealing you set the reward and unappealing you make the penalty, the more eager you will be to reach your goal. My Benefits: Peak physical and mental health, increase in productivity, money savings, more outdoors time, the feeling of pride in knowing I ran 26.2 miles…and the ability to check it off my bucket list! My Consequences: Disappointing myself, letting down those who believed in and supported me, falling out of my exercise routine, etc. My Reward: Treating myself to a vacation with my best friends whom I rarely see anymore. My Penalty: No eating out for three months after the race date. Speaking of driving factors, I recently stumbled upon a really neat online goal-setting tool known as stickK. Developed by behavorial economists at Yale University, StickK is a goal-setting platform aimed at helping people achieve their goals through the power of incentives and accountability. The site boasts that people are three times more likely to achieve their goals using StickK's method. Want to skip along a yellow brick road to success? The Beeminder app allows you to follow your own virtual yellow brick road to your final destination (goal completion). The catch is that if you wander from the road due to bad habits, the app will charge you money according to financial penalties you set prior to starting your goal. An interesting feature of Beeminder is that it works in conjunction with various health and business productivity apps (think Fitbit and Garmin for health, and Trello and Slack for business), pulling data from them to work more effectively in helping you stay the course. Now that you have your motivating factors in place, consider possible obstacles that may prevent you from reaching your goal. Predetermining these obstacles (and putting them in writing) will help you recognize solutions before they have a chance to derail you. Obstacle 1: I’ve never run more than 13.1 miles before, so how do I double that? Solution 1: Join a local running club to seek advice from and train with experienced runners. Obstacle 2: I work a full-time job; it’s nearly impossible to complete my run before it gets dark. Solution 2: Run with the club when possible as an extra safety precaution. On days I have to run alone, arrive to work an hour early and eat lunch at my desk, so I can leave work early. In football, most touchdowns aren’t scored by 50-yard or more runs. Offense typically creeps to the end zone one first down at a time. You can apply this same concept to your overall goal by breaking it into "yard markers," turning one large goal into smaller, more attainable goals or tasks. Your end goal will seem much more realistic when you accomplish it in bites, rather than trying to swallow the entire thing at once. My “Yard Marker” Plan: Tailor a proven running schedule to a schedule that safely builds up my distance within my allotted training time, and set future distance milestones on my calendar to stay on track. If you are looking for a fun way to track goal-oriented tasks, get creative with habitica! Habitica is a free app that encourages users to gamify their tasks, as a self-motivation tool to achieve goals. If you're looking to create more of a clear balance between personal and professional goals, the Strides app might be more your pace. Strides allows you to designate your goal as a Habit, Number or Project, and tailors tasks to the type of goal you've set. Want something simpler? Check out HabitHub. This app keeps things low key and only aids users in tracking their habits and daily progress. All data is tracked and displayed in an easy-to-digest graphical format. A key component to achieving your goal is to surround yourself by the right people. Identify people in your life who will support, encourage and build you up, and steer clear of the naysayers. Those who present a roadblock in the trek to goal achievement are jealous because you have a plan and the drive to better yourself. They will make every attempt to drag you down and then say “I told you so!” when you fall short. Now that you’ve survived this goal setting and achievement crash course, it’s time to take action! Whether you’re looking to improve the workflow in your lab with automated chemistry analysis or your goal is to climb Mt. Everest, start with a brainstorm session of things you’d like to achieve, narrow your focus, put the process to work and watch amazing results unfold. Need inspiration to get started? Watch this powerful news story about Will Turner, a Virginia man who recently achieved his ambitious goal of completing 60 triathalons in one year at the age of 60! *Note: Xylem is not affiliated with any of of the apps or websites mentioned in this post.